Cairo: Egypt's entertainment industry, the oldest in the region, has felt the brunt of the political turmoil and insecurity which followed Mubarak's toppling and the imposition of a curfew. Operators of cinema houses say they have suffered huge losses because they have to end screenings at midnight. "A rise in violence and acts of thuggery has kept cinema-goers away," said Mustafa Ahmad, an attendant at a central Cairo theatre. "Despite repeated pledges by the government to beef up security, people still feel insecure. We had to cancel several showings because fans failed to show up over security concerns," he added. As Egypt is edging towards democracy, its entertainment community is pushing for scrapping censorship, which they say has long stifled creativity. Recently around 600 filmmakers, entertainers and critics signed a petition to the military council, which has been ruling Egypt since Mubarak's overthrow, demanding "the concept of art censorship be reconsidered". Restrictions from censors in Egypt resulted, among other things, in the emergence of independent films, which are films made illegally without approvals from the Censorship Board or the Ministry of the Interior," read the statement. In an apparent response to the campaign, Sayed Khattab, the incumbent chairman of the governmental Board of Censorship, voiced support for this demand. He said his board would approve previously rejected screenplays tackling taboo issues such as the assassination of president Anwar Al Sadat — who ruled Egypt from 1970 to 1981 — and power inheritance. Producers of Egyptian comedian Tala'at Zakaria's latest film Al Feel fi al Mandeel (The Elephant in the Hanky) had to postpone its release for public screening for fear of incurring heavy losses after anti-Zakaria protesters threatened to launch a boycott drive against the film. 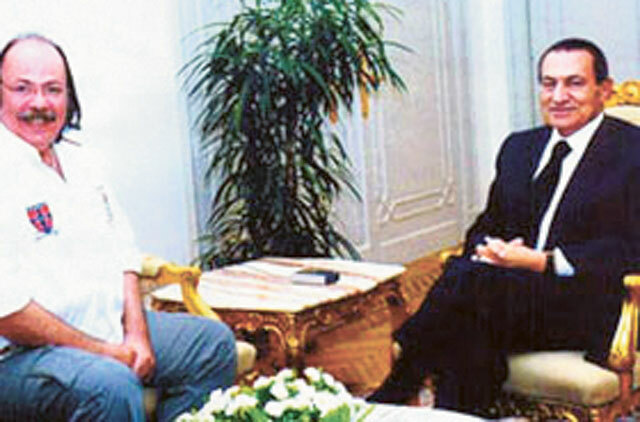 Zakaria, a comic sensation and a pronounced loyal of former president Hosni Mubarak, outraged many Egyptians when he appeared on a privately owned television show during the 18-day popular revolt against Mubarak to condemn the protesters as engaged in immoral acts while gathering in Al Tahrir Square, the epicentre of the uprising. Zakaria is not alone in this dilemma. In the wake of Mubarak's removal last February, young Egyptians compiled a ‘name and shame' list of entertainers whom they believed voiced opposition to the revolution. The list includes actress Gada Abdul Razeq, top comedian Adel Emam, pop singer Tamer Hosni and musician Amr Mustafa. Some of these entertainers later recanted their pro-Mubarak statements, an attempt that has made little impression on their detractors. Meanwhile, several actors who joined angry protesters such as Amr Waked and Khalid Al Sawi, have been catapulted to new heights of popularity. Fans are showing their appreciation of Al Sawi by flocking to his recently released film ‘Al Fajumi,' a biopic of the life of maverick lyricist Ahmad Fuad Nejm, who was an outspoken critic of the Mubarak regime. In an obvious bid to capitalise on the lead actor's new-found fame and the anti-Mubarak revolution, ‘Al Fujimi,' the first film to be shown after Mubarak's toppling, includes real-life scenes from protests in Al Tahrir Square. The second post-revolution film playing at local cinemas is Sarkhat Namla ‘A Cry of an Ant,'' starring actor Amr Abdul Jelil, highlighting hard life and oppression under Mubarak. Its director Sameh Abdul Aziz joined in Al Tahrir Square protests and captured some of them on his camera to replay in his film, shown at the recent Cannes Film Festival. Several projects have been unveiled for producing films revolving around the revolution. Observers, however, say such films are geared to cash in on anti-Mubarak sentiment. "We have to wait for some years before well-researched films are made about Mubarak's epoch and the revolution," said Hussain Mahrous, an entertainment critic. "Of course, entertainers, who angered protesters with their views during the revolution, will continue to suffer for some time," he told Gulf News. Summer is usually a peak season for film screenings in Egypt. Apart from revolution films, comedy is expected to be a top fare this season in an attempt to cheer up Egyptians whose national economy has been in the doldrums over the past four months, according to insiders. "I think this summer will not be a successful season," Muneeb Shafae, the chairman of the Chamber of Cinema, told Gulf News. "People are unwilling to go to cinemas at night and probably in broad daylight fearing for their safety. Moreover, producers are not ready to take the risk and show their films in these uncertain times," he added. The Egyptian theatre is no exception. Veteran stage director Jalal Al Sharkawi has rehashed his show Donia Araguzat, ‘A World of Puppets,' in which he tackles Egyptians' woes and the uprising against Mubarak. In one scene, he handles alleged plans by the former president to groom his younger son to succeed him. Such a scene would have been impossible to make under Mubarak who ruled the country for nearly 30 years with an iron fist. In the last scene Al Tahrir Square is revisited.